The holidays are upon us. It seems there are more ways than ever to market, advertise, and impulsively coax us into the latest deal. Our goal in putting out our annual Early Childhood Matters toy shopping guide is to help families make conscious, intentional choices about their toy purchases - focusing on toys that will last, both in quality and from a developmental perspective (i.e. things they will not outgrow by tomorrow). The easiest way that I (mostly) avoided lots of toy clutter as a parent was to think of our home play space as a classroom. I have tried to only buy toys for my children that I would see in high quality early childhood educational settings. Thinking consciously about the toys you provide instead of buying every "latest and greatest toy" not only helps to teach your child the value of simplicity, but also shapes their imagination, creativity, and independence in play. AVOID: Toys Tied to Media. Not only will your child’s obsession with the character likely fade quickly - these toys are often made more quickly and cheaply than a quality toy. Also, research suggests that children are more scripted and less imaginative (and often more violent) with toys that are tied to media characters. ALTERNATIVE: If your child is into a certain superhero, for example, buy a high quality cape and mask that can transform to different characters over time. AVOID: Toys that Light Up, Make Noise, or Just Do "Too Much." These toys can often be overstimulating from a sensory perspective. They also reduce active participation in your child's play, and are usually on the "first to break or be forgotten" list. ALTERNATIVE: Look for classic or wooden toys whenever possible, and stick to toys where imagination and action is not included, but must be added by the child! AVOID: One Dimensional Toys. A complicated pirate ship will always be a pirate ship. ALTERNATIVE: When possible give blocks, LEGO, or other open-ended building materials (see below) where children can build a pirate ship one day and sailboat the next. Imagine your child playing with this in 6 months, 1 year, 2 years. Ask yourself will this toy "grow" with my child? Think about the early childhood curriculum areas below. Which area is your child most drawn to? Buy toys in this area, but think about reinforcing areas of your child’s toy collection that are less-preferred. This encourages taking risks in other types of play as well. Go through your toys and donate or discard what your child has outgrown, lost, broken, etc., before you start shopping. Seeing these things will likely help you to make more conscious choices. For every item you buy make sure to buy a basket or other storage container to go with it to encourage your child to keep their toys organized. * Denotes toys that are appropriate for children three and under! While we have provided some online links for your reference, we encourage you to shop local wherever possible. Some of our favorite local shops include Paxton Gate: Curiosity for Kids, Tantrum, Fiddlesticks, Recess, Green Apple Books, and, of course, consignment shops like Chloe’s Closet. We also like to check out local parent listserves, Craigslist or neighborhood parenting pages on Facebook for gently used children’s items. A quick online search will yield an abundance of postings for items like balance bikes, play kitchens, train sets, clothing and baby gear. Not only is this a great way to keep costs down during the holidays (and throughout the year), it is also a great way to connect with your community, reduce waste, and help your neighbors de-clutter! * Wooden Blocks: If you don’t have a solid collection of wooden blocks, I would recommend starting here. It is great to have a large selection in a variety of shapes and sizes, to inspire limitless creativity in building. Consider adding another set to existing sets, as more blocks open up more possibilities and show capture the imagination of most until at least 7 years of age! Global Animals Animal figurines are great compliments to a child's block building adventures. Many local toystores also carry the German made Schleich animals which are incredibly well crafted with very accurate details. * Giant Wild Animals (Giraffe is 1 foot high) Especially for our youngest players, these oversized soft yet sturdy figurines will certainly delight and inspire! Castle Blocks or Town blocks: Add variety to block play with these imaginative features. Marble Run: Children can create their own marble run and learn about cause and effect by testing their design to see if their marbles make it through to the end. This heirloom quality wooden set is sure to last and entertain for years to come. There is also a less expensive plastic version-just be sure not to purchase one that can only be built one particular way which is definitely not age-appropriate for the younger builder. *Discovery Ramps: For those budding engineers, a great way to learn about force, motion, and gravity. A bit of an investment, yet seriously a gift that grows with your child. *Magna Tiles: These colorful tiles make our list yet again as they will hold a child’s interest (while building engineering skills) well into elementary school. If you got your first collection last year, consider adding another set as children can certainly construct new and different things with a bigger selection. You can also add a “wheels” set! *Light Table: To add extra fun to your Magnatiles, and life in general, a Light Table is pretty amazing. This is definitely an item that will grow with your child. Provides a calming input for children while they sort, count, trace, wonder and design. Keva Planks/Citi Blocs These structural planks are all exactly the same size and can be easily approached by the youngest and oldest of builders (read:parents love them too!). The possibilities are literally endless. Design and Drill: This can hold the attention of a little one for hours on end. The mechanical drill allows them to put colorful screws into a peg board and reverses to take them out again. Wooden Dominoes: Endless sorting, stacking, and fun domino runs! *Doctor's Kit I fell in love with this little kit at Paxton's Gate and I think it will be under our tree this year. *Teepee A carved out little place to play sets the perfect scene for your child's adventures. These beautiful handmade Teepee's from Teepee Joy are pretty magical but a quick google search and you'll find many options and price points abound. *Road Tape This is under $10 and could quite possibly change your life. Pre-school teachers have been doing this with masking tape for years, but the clean up was rough. Genius! *Baby Dolls These adorable and afforadable dolls will be beloved by toddler boys and girls alike. 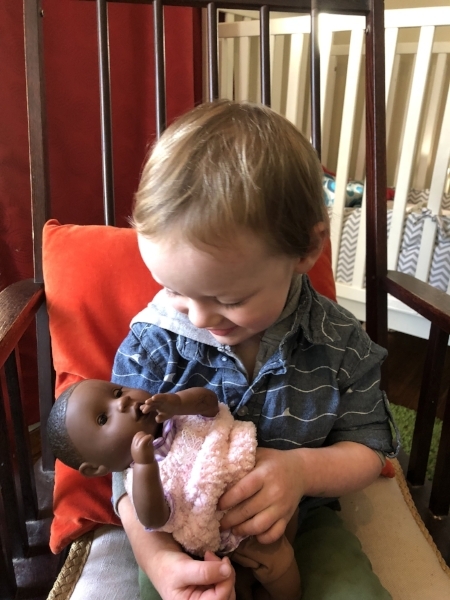 When selecting baby dolls, think about dolls that are diverse in ethnicity/gender/appearance as a way of providing both a mirror and a window for your child's own experience. A Baby doll stroller can add great fun for indoor and outdoor walks and nurturing imaginative play. *Doll-sized baby carriers and wraps are also a sweet, hands-free way for toddlers to transport their lovies just like grownups (and can be helpful in the adjustment to having a younger sibling!). *Tool box: Wonderful for imitating and “helping” parents with home repairs; these also help develop fine-motor skills and teach cause-and-effect. Put Together Construction Trucks Trucks a young toddler can put together and take a part with their own screwdriver! What could be better? Be sure to get or plan for a container to keep all the parts in one place! *To encourage your little helper to join in household tasks in a more practical way, child-sized brooms and dustpans (like these) are a great place to start. Fort Magic/Fort Builder – Children love forts! They are a safe place to hide, help them feel powerful, and create plenty of opportunity for imagination. Fort kits, such as Fort Magic provide the basic building tools to provide structure for unlimited possibilities. * Silk Wings, Sky Tails and Play Silks by Sarah’s Silks offer even more open (and pretty magical) ways to dress up and imagine. These are available at many local shops including Paxton Gate. Marker Stand: End the hunt for marker lids with this great teacher hack! * Easel and washable paint in primary colors for hours of mixing fun! Magnet Board: Can be homemade (framed metal sheet). IKEA has a great one. Masking Tape: Consider starting or adding to your child’s collection of masking tape-colors and patterns are nice too! * Water Paper: Paint it, let it dry, paint it again. Reusable and wonderful! Balance Bikes are preferable to scooters for building left/right hemisphere connections and, well, balance. Mini Trampoline great energy release on rainy days! *Radio flyer rocking horse: One of my all time favorite toys for indoor energy outlet and proprioceptive and vestibular stimulation. Product description says ages 2-6, though my 8 year old still loves this thing! * Door swing/indoor gym-for an active toddler (and way beyond!) a door swing or ladder to climb will provide countless moments of indoor fun, muscle building and energy release. This beautiful indoor or outdoor horse swing is especially nice for the younger child. * Bop It Bag or Punching Ball With Stand: Great for getting energy out and meeting proprioceptive needs especially on rainy indoor days! * Balls: a good collection of indoor soft balls to help redirect the toddler throwing stage, as well as some balls to bring along to the park! * Scarves: store bought or a thrift store collection to encourage dancing, imagining and moving in creative ways. *Jungle Jumparoo: By far one of the coolest toys around. This looks like it would be ideal for a backyard setting, but is an amazing indoor addition. It doesn’t take up a ton of space and is a safe, fun way for toddlers and preschoolers to get their energy out. You can also attach a swing to the top for added fun. For an extra discount on this fabulous toy, enter EARLYCHILDHOOD at checkout! Climbing Dome: For those of you with outdoor space, this is a great investment. Children from 3 up to pre-teens will benefit from a geometric climbing dome. Add to the fun by attaching a swing or spinner to the top. Another great idea is to get magnetic letters to put on the sides and do a “word hunt” with older preschoolers. Climbing to the top and searching for letters adds to the adventure. Jumbo Parachute – Aside from the obvious ways to play with this toy, draping it over a fort or play dome make an instant hideout. Seeds to plant a garden from Kids Seed Co. Dig It Up: Ages 4+ Numberous sets for excavating dinosaurs, animals, minerals and fossils, and fairies. Rootvue Farm: 3+ Watch vegetables grow! The holidays are a wonderful time to build your child’s library. Listed below are some of our recent favorites-books that our children request time and again, and that we are happy to read as often as they like. Our favorite books tend to include rich, detailed illustrations (often with humorous hidden details), books that highlight and celebrate diversity, and books that carry valuable messages in a beautiful, lyrical voice. Little Humans by Brandon Stanton. The creator of Humans of New York wrote and photographed the images in this book. Simple, empowering text with gorgeous portraits of children in New York City. All the World by Liz Garton Scanlon. A lovely, gentle book about families living through the simple joys and disappointments of a single day. A great story to read before bed; its nature-centered illustrations and mellow, reassuring rhyme are incredibly soothing for children and adults alike. Joseph Had a Little Overcoat by Simms Taback. A simple folk tale with a message, masterfully illustrated with die-cut images and plenty of hidden details that will make adults chuckle. There is a song version of the book that is fun to sing with toddlers. The Day the Babies Crawled Away by Peggy Rathman. A funny and tender story of a small child coming to the rescue when a group of babies escape from a pie-eating contest, written by the author of the classic Good Night, Gorilla. The illustrations are all in silhouette, making it visually striking to look at. Cars and Trucks and Things that Go by Richard Scarry. We love this book (and really, anything by Richard Scarry) and so do our kids. The incredibly detailed, whimsical illustrations and meandering storyline mean that there is always something new to notice in its pages. The Ultimate Book of Vehicles from Around the World by Anne-Sophie Baumann. If your child loves vehicles and/or Richard Scarry books, this gorgeous book is a great next read. It features realistic but fun illustrations of a wide variety of cars, trucks, boats and planes (even rockets!) and has pop-up features and moving parts throughout the book. A fascinating keepsake. The Great Big Book of Families by Mary Hoffman. Another beautifully illustrated book, filled with detailed illustrations that even the littlest readers will pore over with interest. This book explores and celebrates families of all kinds. It is a fantastic book to have in your library as your child grows, gracefully addressing big topics and opening the door for meaningful discussions. Life-Size Zoo by Teruyuki Komiya. This is a fascinating book that will grow with your child. It features up-close, fold-out, life-size photographs of a variety of different animals. Toddlers will enjoy looking at their favorite animals and pointing out body parts; older children will love learning interesting facts, which are written and illustrated in small comics along the margins. Also, check out the NY Times Notable Children's Book of 2017 list here. No matter your age, there is something special about having a real instrument of your very own. Ukuleles are just the right size for toddlers to strum, and are quite pleasant to listen to (as long as they are in tune!). Small instruments such as kazoos, egg shakers, tambourines and harmonicas are also great fun for budding musicians and make for very affordable gifts for the younger set. Family Board Games: Make family game night your new tradition in 2017. Board games promote family bonding, literacy, math and logical thinking skills as well as soft skills such as communication, cooperation and fair play. Check out this list of favorites for the pre-school audience. Experiences: Especially great for gifts from grandparents, a picture that depicts going to a nearby park, to a science museum, aquarium, boat ride on the bay, picnic at the beach, etc. or something else they plan to do with the child in the coming months. You may also consider asking grandparents for a family photo shoot with a local photographer, a game or book that they enjoyed in their childhood and the promise to share in the fun, or to teach your child how to prepare a favorite family dish, basic sewing, woodworking or another skill that can be passed down to the next generation! Stay tuned for DIY gifts your kids can make themselves. Newer PostHappy Mother's Day! Cherishing the little moments when they grow big so darn fast! Older PostIndoor Activities to the Rescue!